This blurb came from the publisher. BP Note: The publisher is sponsoring a giveaway. Information about the giveaway and the author is at the end of the review. Good luck! E: I thought the blurb for Power Play looked interesting and since I had not read anything by Snow previously I thought I would give this story a try. Sadly, it didn’t end up working for me. I found the heroine and both(?) heroes rather unlikable. I say both(?) heroes not because their relationship is a ménage but because Power Play is only the first installment in what appears to be a trilogy with Sage, Parker, and Ryker in a love triangle. If I had known this I would not have accepted the review request because I am rather tired of love triangles, and really tired of love triangles which are not resolved at the completion of the first novel but instead appear to continue through the series. Has: I really enjoyed Tiffany Snow’s previous series and her stand alone serial even though like E, I am over the love triangle trope. But I liked Snow’s voice and she made this trope interesting in her Kathleen Turner books, and I was looking forward to this new series because the blurb sounded great. I have to agree, sadly, because I also couldn’t warm up to the main leads and I especially disliked Parker who was one of the love interests. I also found the heroine annoying and not as developed as Snow’s other heroines. E: Sage was an executive administrative assistant who appeared to let her job rule her entire life. Only it wasn’t her job it was her boss, his constant demands for things at all hours and locations, and her blind loyalty to him. She was really good with her job but she neglected so many other aspects of her life. I also had the feeling she was rather sheltered and on several occasions I was tempted to chuck my reading device in frustration due to her thoughts and actions. As the story progressed, and Sage had more personal encounters with the bad guys, she continued to remain involved because she refused to take the advice of either Parker or Ryker. I found this extremely annoying and really started to wonder what it would take for her to actually act in any sort of self-preservation way. Has: I also felt the same frustrations with Sage, while her heart was in the right place, she never understood or took in the danger she was facing especially when she heard about a murder of a woman whose sister she was helping. I disagree with you about refusing to take advice. Parker didn’t trust her about important details surrounding the deal they were embarking on with the Russian Maffia. Ryker placed her in danger at the end of the book by wanting her to do something that would have jeopardised her without a backup, or ally, who knew what she was doing especially when the villains were suspicious already. E: I also struggled with both of the two male leads. Parker and Ryker had an unsettled past together. Once good friends, now they weren’t quite sworn enemies but they held a grudge and were willing to act on their grudge against any mutual acquaintances or interests. This continued to involve Sage and like her I had a hard time believing Parker or Ryker when they said certain things based on both their behavior in this story and their past history. I did not like how they tried to manipulate Sage professionally and personally. Her safety/wellbeing seemed to come in second to their past dispute, even when it became evident she was at serious risk. I will admit I was curious about how they went from their shared mutual past to completely opposite professions of police and high-powered banker/broker. Although one of the reveals about Parker and some of his behavior under stress did indicate a certain similarity, I had a hard time connecting their past friendship to their current actions because it never seemed to peek through. Has: Oh I totally agree! And I felt the reason and tension of their falling out exacerbated the issues that I had with the love triangle, which didn’t work for me. It just highlighted the reasons why I am not a fan of this trope, and I disliked that Sage was tooing and froing from one guy to the next and back again without any real build-up or good reasons. It also made her character inconsistent and fickle. If I had not read Snow’s previous series, I don’t think I would have picked up another book of hers because this book had all the hallmarks of the pitfalls of a love triangle gone wrong. E: In addition to my inability to enjoy the main characters in Power Play, I also could not suspend belief with some elements of the plot, or rather the action – reaction sequence in a few instances. As a result, I was jarred out of the world-building and lost any sense of suspense/anticipation to the point of finding myself just really flipping through what ended up being the climactic moment of this installment. I did force myself to go back and read that section but it was indicative of my lack of interest in the characters and the resolution of some plot elements by that point. Then when Power Play ended with a lot of things still up in the air I felt like I had finished the story without any payoff. As I said in my first paragraph, sadly, my first experience with Snow was not a positive one. This particular style of trilogy and romantic arc does not work for me. 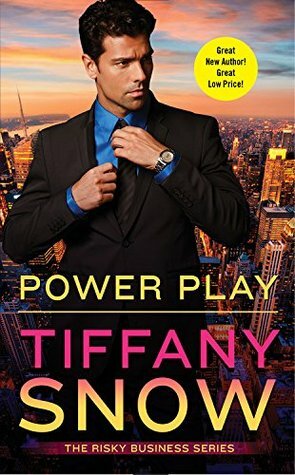 If I had known the love triangle (romance aspect) was not resolved in this first installment and that the male leads had some issues to work out from their mutual past I would not have agreed to review Power Play to begin with. Has: I feel sad and disappointed because I really wanted to like this book, but it failed to reach my expectations although anyone who likes the love triangle trope may enjoy it. Power Play reflected why I don’t like this premise. I also think the characters did not appeal to me as her other main leads from her other books and because of this I could not engage with the book. I am not sure if I will check out the next book in this series, and if I do, I will probably wait for the reviews to see how things pan out. Power Play was a let-down for me because I found the characters lackluster, the love triangle forced-angst, and a plot that never really shone.